Lori and I followed the sun to Puerto Rico for my (and consequently, her) Spring Break. After landing in San Juan, we followed the signs for Rental Car Shuttles. Luis Muñoz Marín International Airport is actually a good size airport, much larger than Las Américas in Santo Domingo. Final bill for 7 days (which I received a few days ago) came to $125.00. Not bad! And looking back now, even factoring in spending 48 hours on an island during which the car was inaccessible, it was worth every penny. Luckily, when we left DC, we also had the foresight to check Lori’s Garmin Nuvi GPS to see if it has full maps and navigation capability for Puerto Rico, and sure enough, it DOES! So, we didn’t hesitate to bring that along, and it was one of the best travel decisions either of us have EVER made. Word of caution, however: We still ended up consulting a map regularly as many of the roads in PR (especially in San Juan) have two different names, and businesses seem to make a point of using the name that neither Garmin nor Google Maps uses. One of THREE swimming pools at Coqui Inn in Isla Verde, Carolina/San Juan. Now, I won’t spend my time here going off on a tirade about how Cancun and Mazatlan are neither countries nor really “third world” destinations. I offer this phrase only to illustrate why we couldn’t take these reviews very seriously. 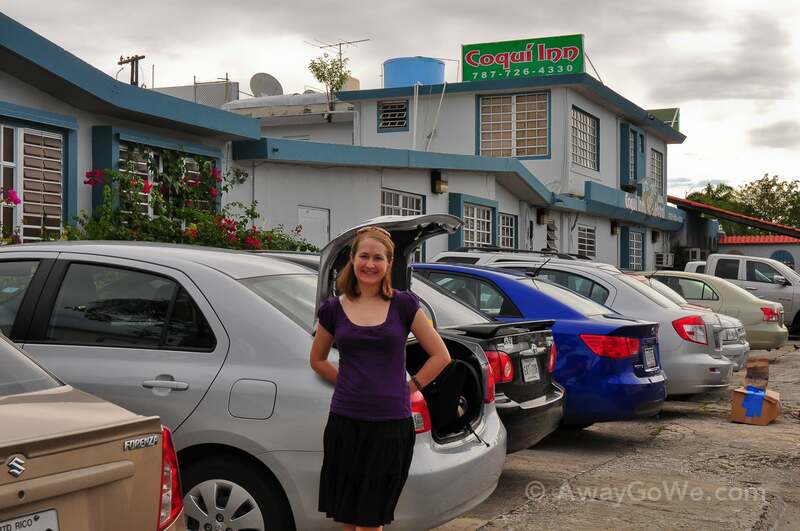 In reality, Coqui Inn was a refreshing and delightful surprise. Free and secure parking, spacious and clean rooms with A/C, three crystal clean pools, and friendly, knowledgeable staff. The room we had was very quiet, and the layout of the place was just downright funky and cool. It is essentially three old motels joined together to form one large motel compound done-up in a tropical motif decked out with reed fencing and bright colored murals on the walls of the open-air corridors. And the price was about $80 per night (I found a 5% off coupon for Orbitz at CouponCabin.com. I always check in with CC before purchasing anything on line). One of the colorful wall murals at Coqui Inn. Granted, Coqui was about twice as much as the most expensive place we paid for in the Dominican Republic last spring (and that was a 2-story beach bungalow) but PR is not the DR when it comes to costs. Your dollar will go much further in the DR, largely due to the fact that Puerto Rico is a U.S. territory, and consequently, uses U.S. dollars. There are other factors too, but that’s a biggie to be reckoned with. 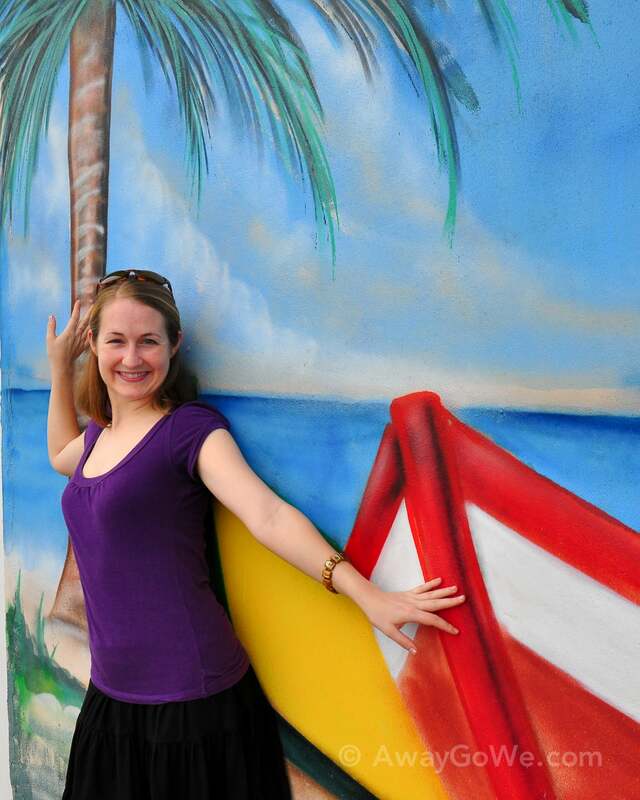 Lori posing in front of the rental car at Coqui Inn, Isla Verde, San Juan, PR. Already exhausted and hungry from our travel day, we locked up our room and headed downstairs to ask the lady at the front desk for suggestions on area eats. On the flight to Puerto Rico, I will say that I was impressed with JetBlue’s selection of free snacks. Yes, free snacks! Most airlines don’t even give you a 2 oz. bag of pretzels anymore. Up until last year, Continental was still offering their passengers complimentary full food service! We’re talking sandwiches, fruit, crackers, cookies, etc. By the end of the year, however, Continental had discontinued this practice — likely one of many changes coming as a result of last year’s United Airlines acquisition. But JetBlue still passes out large bags of chips, cookies, cashews, and other goodies (and by large, I mean the bags that typically sell for $.99-$1.50, not the “fun-size” bags). Ok, back to Coqui Inn and dinner. And by the way, a Coqui is a type of really cool Puerto Rican frog, but we’ll get to that later. 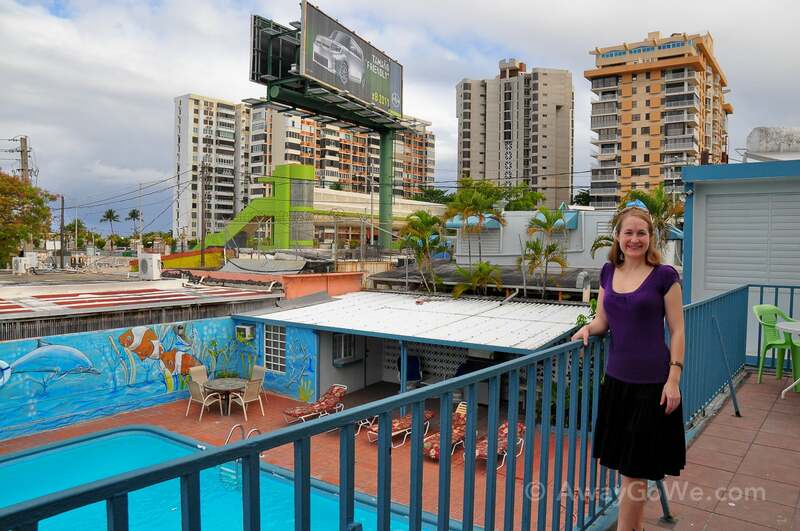 The lady at the front counter suggested we try a couple of places right over the skyway on the beach-side of the highway along Avenida Isla Verde, the main drag lined with high-rise resorts and casinos. We stopped in at a little place called Ruben’s Cafe, which looked shady on the outside but ended up being one of the best restaurants we ate at our entire trip. In coming to PR, all I really wanted to get my hands on was some slow-roasted pork in yummy sauce with a side of rice, beans and mofongo. I thought this would be easy enough and I looked forward to devouring many more such dishes. But alas, this would be the one and only time I would come across the dish. Oh, to go back in time and whisper in my younger self’s ear: “this will be your only chance! Savor it…” But I think I did a pretty good job of enjoying my meal in spite of not knowing what the future held, and in fact I was so hungry, I really was eating like there was no tomorrow. Yeah, we could have stayed out. We could have thrown a few bucks down on Red, at a casino thrown back a couple of Medalla Lights and hit the clubs. But the long day was definitely wearing on us, and we knew we wanted to get up early to explore as much as Old San Juan before having to hit the highway to the mountains where we had lodging reserved. So, we headed back to our humble abode and called it a night. But we had managed to make a brief stop at the beach across from the restaurant to check on the ocean and make sure it was still there. And indeed it was, or at least what we could see of it at 10pm. We walked through a little funky tiki bar filled with young hipster Japanese tourists attached to a high-rise hotel. It’s definitely the kind of place you could grab a cocktail and zone out at for a couple of hours, aided by the ocean breeze and sounds of trance music and waves crashing nearby, if the drinks hadn’t been an astonishing $14 each. Instead, we resigned ourselves to zoning out to the hum of the air conditioning unit in our room back at Coqui, as we drifted off to Caribbean dreamland. 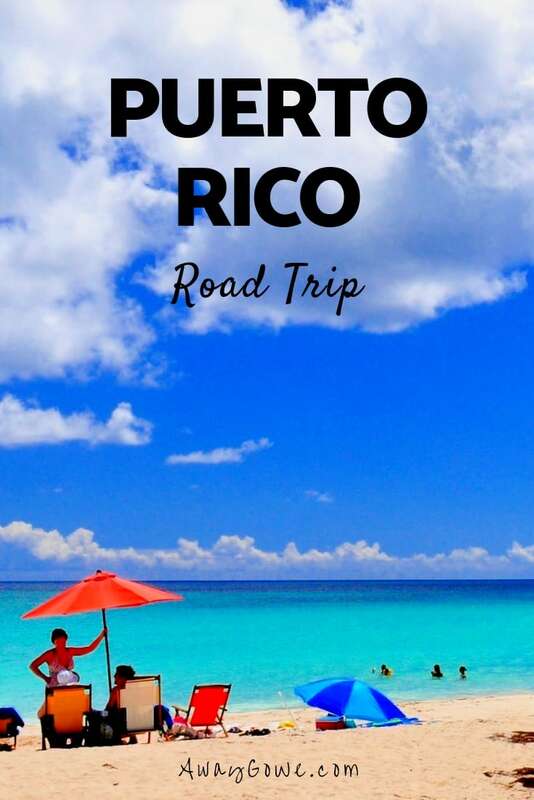 Tomorrow, Old San Juan and the Puerto Rican Rain Forest! I went to school for a semester in San Juan and used to always go out in Isla Verde. Such fond memories there! You guys will have to decide if hearing the coquis all night long is a nuisance or soothing. Noisy suckers!